Thomas Fire Is Now California's Largest Wildfire In History : The Two-Way State fire officials say the fire burning in Santa Barbara and Ventura counties is bigger than the previous record holder — the 2003 Cedar fire in San Diego County that killed 15 people. 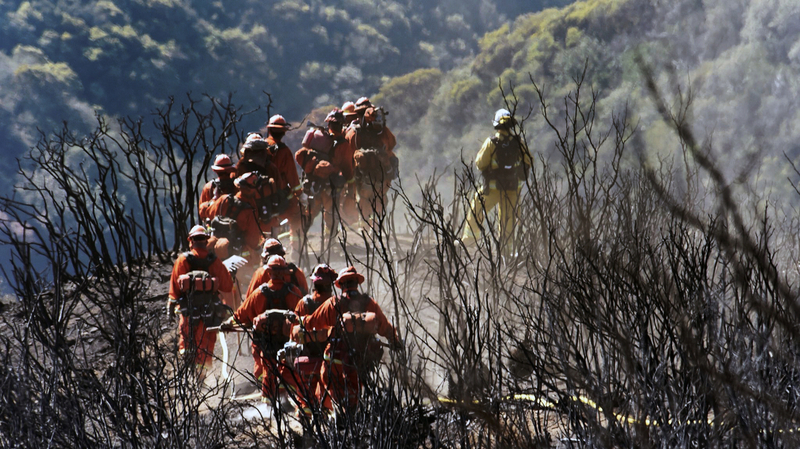 In this photo provided by the Santa Barbara County Fire Department, CAL FIRE Inmate Firefighting Hand Crew members hike through the charred landscape on their way to work east of Gibraltar Road above Montecito, Calif., earlier this wee. Thousands of firefighters and fleets of aircraft have been battling the deadly Thomas fire since Dec. 4. The fire has been fueled by dry conditions and untamed winds. A firefighter and a resident fleeing the flames died in the Thomas fire. Officials say this year's fire season has been the most destructive people in the state have ever seen. "Unrelenting winds and parched weather turned everything in its path to tinder — including more than 700 homes. "The fire in Ventura and Santa Barbara counties had scorched 273,400 acres, or about 427 square miles of coastal foothills and national forest, according to the California Department of Forestry and Fire Protection. That was 154 acres larger than California's previous fire record holder — the 2003 Cedar fire in San Diego County that killed 15 people. "The Cedar fire had been recognized as the biggest California wildfire in terms of acreage since 1932. Some fires before that date undoubtedly were larger but records are unreliable, according to state fire officials." The Thomas fire is about 65 percent contained. The Los Angeles Times reports that any new growth on that fire will probably be due to deliberate actions by firefighters. "The main fire itself will not have any growth," said Capt. Brandon Vaccaro of the California City Fire Department. "Any growth that we see or is reflected in the acreage will be based on the control burns." "Firefighters set the speed of the burn, he said, using bulldozers, fire engines and hand tools. A train of personnel moves along, setting the fire to ensure no fire jumps the control line or gets out of hand, Vaccaro said." The improving conditions allowed officials to lift many evacuation orders on Thursday.